The princeps of the Comedy was followed only a few months later by Venetian and Mantuan editions. The immediate and widespread demand for the text, and the extraordinary wealth of manuscripts of the Comedy which were available, explain the nearly simultaneous appearance of the poem in 1472 in three independent texts. 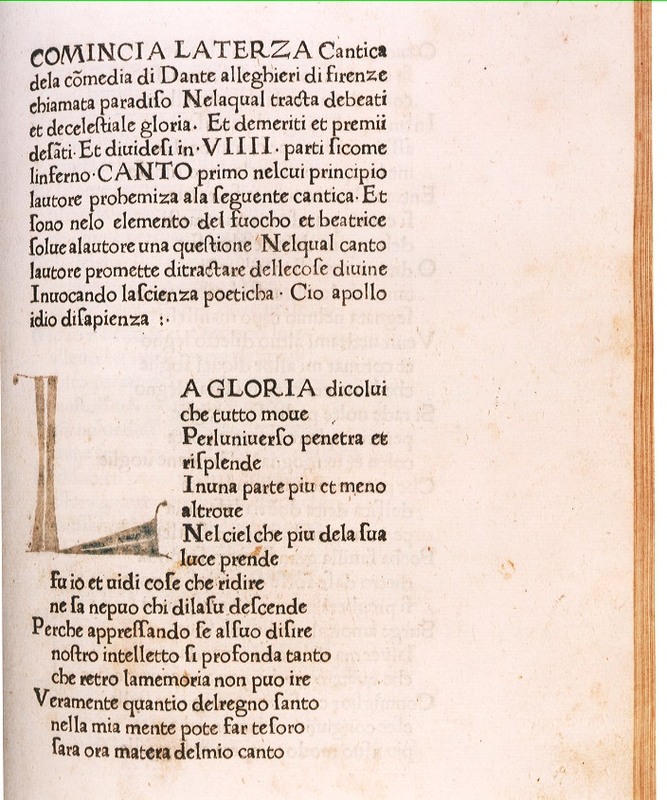 Moreover, Dante's status as an Italian classic, rather than as a regional or municipal Florentine author, is demonstrated by the fact that the earliest editions of the Comedy were produced in centers outside Tuscany including: Mantua (1472), Venice (1472), Naples (1477 and 1478-9), Venice (1477) and Milan (1478). 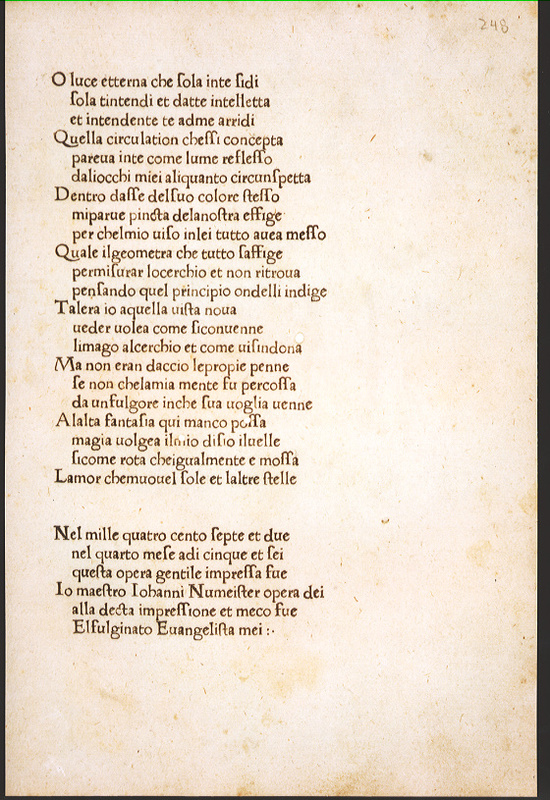 While the Neapolitan editions of 1477 and of Del Tuppo (1478-9) were based upon the Foligno edition, a genuine vulgate (or commonly accepted version) of the text was not established until the poem was accompanied by a modern commentary in the first Florentine edition of1481. 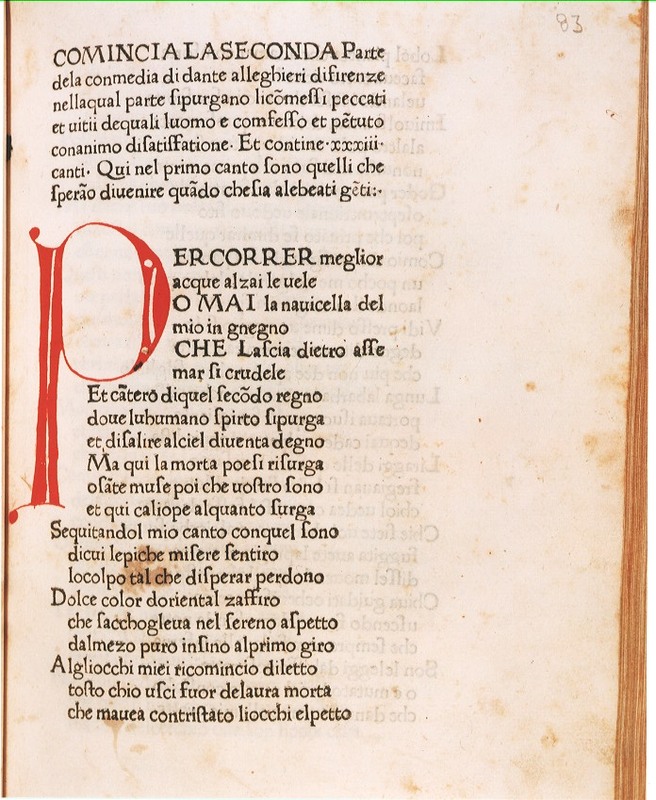 The earliest editions of the poem gave the text without commentary, the Foligno princeps giving only brief arguments before each of the three cantiche and before every canto. Johann Neumeister was a printer and cleric who some have claimed learned his trade from Gutenberg. He came to Foligno as a manuscript copyist in 1464 and around 1470 started a business "in arte impressione litterarum." He purchased type and equipment from Johann Reinhardt, another German printer who had worked in nearby Trevi. Neumeister was not successful in Foligno, however and landed in jail for non-payment of debts. He subsequently returned to Mainz where he is known to have been active in his trade in 1479. He later worked in France, eventually at Lyon, where he died around 1522. 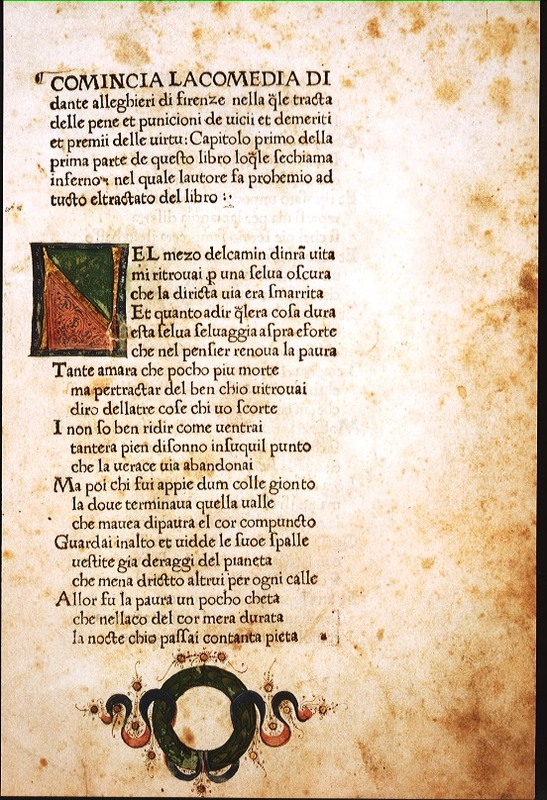 The colophon (an inscription placed at the end of the book with facts relative to its production -- yet another tradition borrowed from the manuscript tradition) of Neumeister s edition reads in Dante's tercet rhyme: "Io maestro Johanni Numeister opera dei/ Alla decta impressione et meco fue/ El fulginato Evangelista mei" (I Master Johann Neumeister, did the printing together with my friend Evangelista of Foligno). Neumeister's collaborator was Evangelista Angelini of Trevi, who had introduced printing to Foligno in 1470.